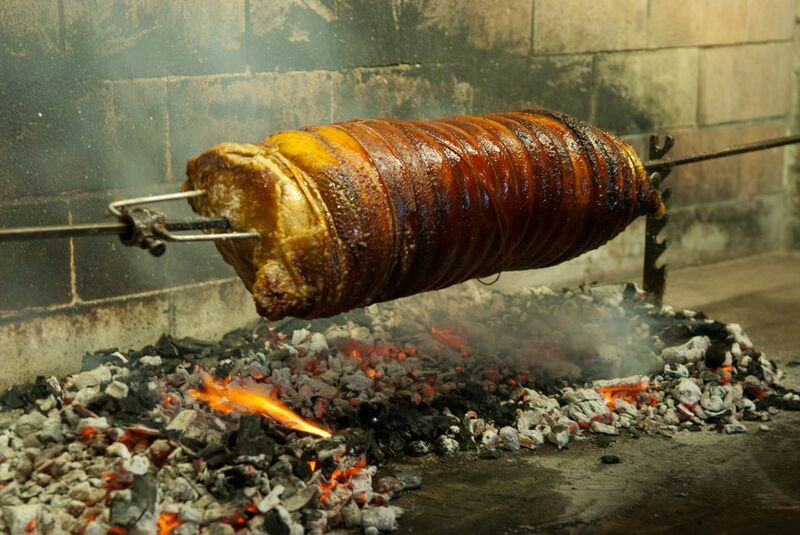 Barding is a technique for cooking meats where the meat is wrapped in a layer of fat before roasting it. The very idea of this seems absurd to us today, and not just because of our singularly fat-averse culture. The notion also seems to miss the point (to us, anyway) of why we bother roasting meat in the first place, which is to produce meat that is tender and juicy on the inside with a brown, crusty exterior. Slicing crosswise into the roast thus yields servings that offer a pleasing contrast of flavors and textures in each bite. Wrapping a roast in fat would prevent the browning of the outside (which happens via a process called the Maillard reaction). Let's remember, though, what roasting was like a thousand or so years ago when techniques like barding were developed. There were no dials or temperature settings in the kitchen, or, for that matter, thermometers. Indeed, there were scarcely ovens. The ones that existed were built of stone and fueled by wood, but they were used for baking bread. Meat was roasted on a spit over an open wood fire or coals. Adjusting the temperature involved moving the spit closer or further away from the fire. Cooking wasn't the only thing different. The meat was different, too. Beef in those days was much leaner and tough than the luxuriously marbled product we enjoy today. Cows ate grass, and they had to roam about to get it. Grass isn't terribly fattening, and roaming leads to tough muscles. Thus the cows that did go to slaughter were invariably on their last legs, meaning older, tougher and chewier. In those circumstances, it made sense to insulate a roast from the withering heat of the open flame. Finally, there's the spit itself. When we roast a piece of meat today, we would never dream of sticking a large rod or spike through it beforehand, because we know that would cause an alarming loss of juices, leaving the cooked meat dry and tough. And of course, loss of moisture from the interior is neither diminished nor abrogated by wrapping the exterior in a layer of fat. But the point is that in the middle ages, roasted meat was dry meat, so a medieval cook could not be faulted for trying anything they could think of to preserve as much moisture as possible in a piece of meat. Another technique, called larding, involves threading strips of fat through the interior of the roast, as opposed to wrapping it in layers of fat. See also the legendary chateaubriand, a roast that was famously prepared by wrapping it in steaks and then roasting it until the outer steaks (subsequently discarded) were charred.